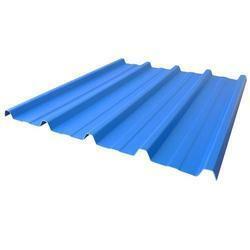 Pioneers in the industry, we offer trapezoidal sheet from India. With firm commitment to quality, we are presenting our clients a vast range of Trapezoidal Sheet. Designed by our skilled professionals using top notch quality raw materials and cutting edge technology, offered trapezoidal is widely used for elevation and roofing surfaces of houses, garages and small commercial buildings. In order to ensure its durability, this trapezoidal is sternly tested on diversified parameters by our quality controllers.